Can you see the difference? All right, if you are still with me, then let’s do a practical example. Your interest might be around PDF creation from your CAD files. There is a standard job for this coming with powerJobs, and there are tons of ways to tailor it. But for the purpose of this blog post, let’s see how to create email notifications with powerJobs. Add-Log -Text "file $($file.Name) transiting from '$($fromState.DispName)' to '$($toState.DispName)'"
Add-Log -Text "file orginated by $($user.Name) and last modified by $($cause.Name)"
$emailSubject = "The file $($file.Name) trasitioned from '$($fromState.DispName)' to '$($toState.DispName)'"
$emailTo = $user.Email # "marco.mirandola@coolorange.com"
Dear $($user.FirstName), the file <b>$($file.Name)</b> transitioned to state <b>$($toState.DispName)</b>, as <b>$($causer.FirstName)</b> changed the state. Add-Log -Text "Sending email to $emailTo, from $emailFrom, with Subject $emailSubject"
Send-MailMessage -From $emailFrom -To $emailTo -Subject $emailSubject -Body $emailBody -BodyAsHtml -Attachments @("c:\Temp\image.bmp") -SmtpServer "10.0.0.26"
Now, the really interesting line is #45, where the Send-MailMessage commandlet is called with simple parameters, that even non-developers can easily understand. The variables above (all starting with $) should also be quite clear. In order to send a message with some individual Vault-related content, such as file information or information around the lifecycle transition etc., we have to “talk” with the Vault server and gather some more details. This would be about 5 to 10 lines of code. With powerJobs, the $file variable, set at the top of the script file, already contains all system and user defined properties and also information about folder location. So, one line does it all for you. Quite handy, huh? Now, in order to try it out, you have to configure the automatic job queuing for the lifecycle transitions you are looking for. This can be done via the LifecycleEventEditor provided by Autodesk. 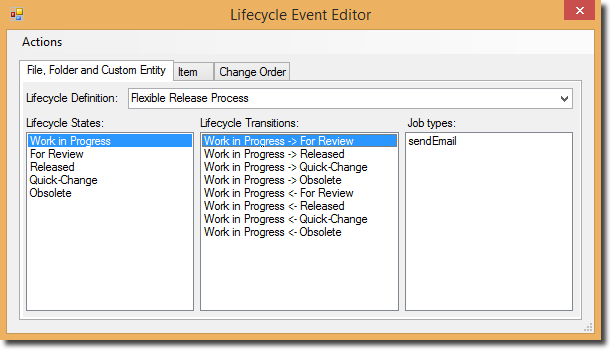 The LifecycleEventEditor is one of the many little secrets of Vault. This tool can be found in the Vault SDK (C:\Program Files (x86)\Autodesk\Autodesk Vault 2015 SDK\util\LifecycleEventEditor). The setup for the SDK can be found on the ADMS Server folder (C:\Program Files\Autodesk\ADMS Professional 2015\SDK) or in the Vault client (C:\Program Files\Autodesk\Vault Professional 2015\SDK). Run the setup and then start the LifecycleEventEditor. You will then select your preferred Lifecycle definition, lifecycle state and transition. Via the “Actions” menu you will be able to add the job to that transition and then commit the changes. The job name is simply the name of your PS1 file without the extension. Doesn’t it look cool??? So, now that you have the technique, you can extend this job to any other scenario. Bottom line, with powerJobs it’s super simple to create a new job and thanks to the new commandlets, it’s also very simple to deal with the Vault API, even for unskilled developers!!! Have fun!! P.s. : if you like to test the script and don’t have an SMTP server at your hand, you may want to use your google account. In order to do that, you have to pass to the Send-MailMessage some more arguments, such as your credentials and the according SMTP port for Gmail. You see that the last arguments are -UseSsl for secure connection, -Credential with the according variable containing you userID and password, and the -Port 587. Now, the $cred needs to contain you username and password and the command-let Get-Credential does this for you. Once this is set up, you still will get troubles from Gmail, as it does not allow to use the SMTP server from every application. In order to change such setting, login into your google account, then follow this link https://www.google.com/settings/security and finally set the “Access for less secure apps” in the “Account permissions” section to “Enabled”. Of course you should set it back once you’ve finished your testing/demo with this job. So, now you should be able to use Gmail as your SMTP server. This entry was posted in powerJobs, PowerShell, Vault API. Bookmark the permalink. Hi Jörg, sorry, this job works only in combination with JobProcessor+powerJobs. The reason is that only with powerJobs you can create jobs using the powerShell language. However, if you are familiar with .Net you can take the code above and translate it to C# and create a custom job with Visual Studio which can be loaded in the Vault JobProcessor. The purpose of powerJobs is to make JobProcessor extensions easy to write and maintain, so that the JobProcessor becomes even more productive. Btw., there is a trial version of powerJobs, so if you like you can have a look. Marco, at some point the job got corrupted can you repost the original code, or post the PS1 file as a download link? Thanks for the hint. Yes, it seems that by copy pasting the code into the blog, some characters got replaced. I’ve cleaned up the the code and it should be fine now. I’m trying to create a job through your application that would send Email notification to selected users about the current Custom Entity but can not find an analog command “PrepareEnvironmentForFile” for Curent Custom Entity. Can I do this task ?